Pearson recently launched a free gradebook tool designed for iPad. Called PowerTeacher Mobile, the app is designed to integrate with Pearson's student information system, PowerSchool. PowerTeacher Mobile allowed teachers to access the gradebook features of PowerSchool to record grades and take notes on individual students and assignments. 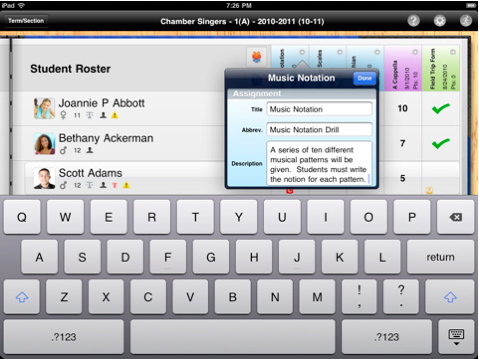 It also lets teachers create assignments, work with groups (for differentiated instruction), and manage rosters. PowerTeacher Mobile is available now as a free app from the App Store. It requires the PowerSchool student information system. It can be accessed directly here.